Boeing-built Intelsat 33e, which launched on Aug. 24, 2016, aboard an Ariane 5 rocket on mission VA232 from Guiana Space Centre, is undergoing in-flight maneuvers using rocket engines made by Aerojet Rocketdyne. The spacecraft is now operational. Intelsat 33e was the debut flight for Aerojet Rocketdyne’s 100-volt electric propulsion subsystem. 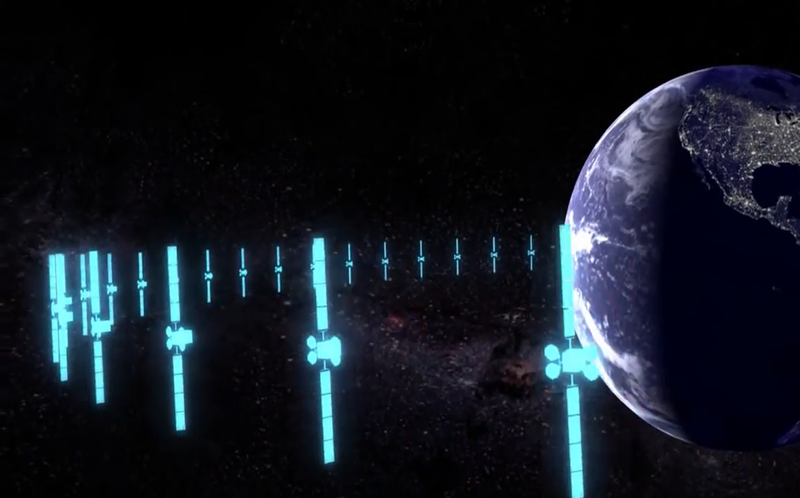 The fuel-efficient system reduces the mass of the required onboard propellant by several hundred pounds and, according to Aerojet, helps to enable high throughput capability for the new Intelsat Epic Next Generation (EpicNG) satellites. Intelsat 33e is based on the company’s Boeing-702 MP platform. The satellite weighs 6.6 metric tons and measures 26 by 12.5 by 10.5 feet (7.9 by 3.8 by 3.2 meters). It features two deployable solar wings, each with four panels of ultra-triple-junction gallium arsenide solar cells, capable of generating up to 13 kilowatts of power. Its designed lifetime is more than 15 years. The electric propulsion subsystem provided by Aerojet Rocketdyne includes a 4.4-kilowatt power processing unit, relay box, electrical harnessing and six 2.2 kilowatt MR-510 electric arcjet thrusters. In addition to the electric propulsion subsystem, the satellite also boasts 16 monopropellant rocket engines: 12 four-newton MR-111C hydrazine and four 22-newton MR-106L hydrazine engines, all of which provide attitude control and adjustment, east-west station-keeping, spin control, decommissioning, and settling burns. These engines were also provided by Aerojet Rocketdyne. Equipped with 20 C-band and 249 Ku-band transponders, Intelsat 33e was inserted into a geosynchronous orbit inclined 60 degrees East. The satellite is designed to deliver carrier-grade telecom, enterprise networks, aeronautical connectivity, and certain media services. Intelsat 33e is the second spacecraft in the company’s EpicNG series – a high-performance, next-generation satellite platform that delivers global high-throughput technology without sacrificing user control of service elements and hardware. Its Ku-band spot beams provide broadband services for Europe, Africa, the Middle East, and Asia, while a Ku-band wide beam provides broadcast coverage of Europe, the Middle East, and Asia. The satellite’s C-band spot beams cover high traffic telecommunications centers in Europe, Central Africa, the Middle East, Asia, and Australia. Its C-band wide beam delivers coverage over sub-Saharan Africa for data and media services. According to Aerojet Rocketdyne, the remaining three Intelsat EpicNG satellites will all include the same complement of six Aerojet Rocketdyne electric propulsion thrusters for north-south station-keeping, as well as 16 hydrazine rocket engines. The next Intelsat EpicNG satellite, Intelsat 35e, is expected to launch sometime this year (2017) aboard a SpaceX Falcon 9 rocket. College student and long time space enthusiast, Jose has been a constant visitor to Cape Canaveral since he moved to central Florida. He joined the SFI team in the hopes of becoming more involved in the coverage of spaceflight and space exploration.